Jan 31 - Ryedale Carers. May 4th - Filey Folk Festival. 1.30 at The Station. May 8th - United Reform Church assembly. May 22nd - St Catherine's hospice. June 9th - Pricehome garden party. Givendale Road, Scarborough. ​February 27th - Scarborough Sub Aqua Club. April 18th, Scarborough @ 2pm, busking outside M&S April 25th, Private 50th Birthday Party, Scarborough. 4.20-4.50pm at the Station Pub. May 9th - Charity function, Scarborough. May 11th, Alzheimer's Society Memory Cafe, Scarborough. June 13th, 8pm Knaggs Head Pub, Scalby, Scarborough. 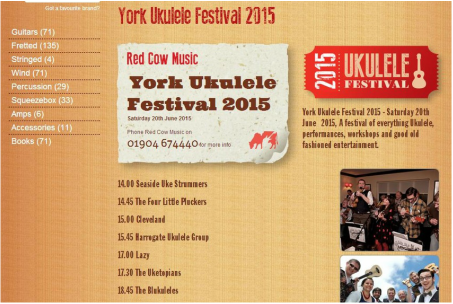 June 20th, York Ukulele Festival, 2pm and 12.45pm at open mic event at the Habit. plus a workshop in the afternoon (12 noon - 1pm in the Jamming Marquee - please bring your own Ukulele). July 10th - Summer BBQ at Emmanual St. Johns Church, St. John's Road, Scarborough, 6-7.30pm. September 19th - Freedom Festival, Woodend Gardens, The Crescent, Scarborough. September 28th, pm - Newby and Scalby Womens Institute Scarborough. October 4th - We Shall Overcome gig in Filey. November 13th - Children In Need at the Crown Tavern, Scarborough. ​December 12th Scarborough Yacht Club. December 19th Busking outside M&S in Scarborough at 2pm. December 22nd Crown Tavern pub in the evening. Saturday 3rd May 2014 - Filey Folk Festival open mic. event at the Grapes pub in Filey, 1.30pm. Wednesday 4th June 2014 - Filey Folk Club at the Station Pub. The club starts at 8.30pm. Friday 27th June Community BBQ at Emmanuel St. John's Church, St. John's Road, Scarborough - 6.00-7.30pm. Saturday 5th July - Busking in Scarborough Town Centre at 2pm. Saturday 12th July 2014 - York Ukulele Festival main stage at 1.45pm and open mic. event at the Habit at 12.00pm. We meet on Mondays at 7.30pm at the Valley Pub, 51 Valley Road, Scarborough, in the room opposite the pool room. All Uke players and would be uke players are welcome. If you are visiting Scarborough and would like to come along to the club, please email for directions. All electrical equipment is PAT tested and we have our own PA system.